What do you do if you need extra content elements or templates for your website? You can buy a bunch of plugins or do some custom code – not an option if you are short on time or on budget. This is where Visual Composer Hub (a free marketplace) can help you out. Visual Composer Premium grants you unlimited access to the Visual Composer Hub – a library of premium quality content elements, templates, extensions, and stock images. With a single click, you can download elements and templates crafted by top web designers and use them on your WordPress site. There are no download limits, simply browse through the catalog of available add-ons and select whatever you like. 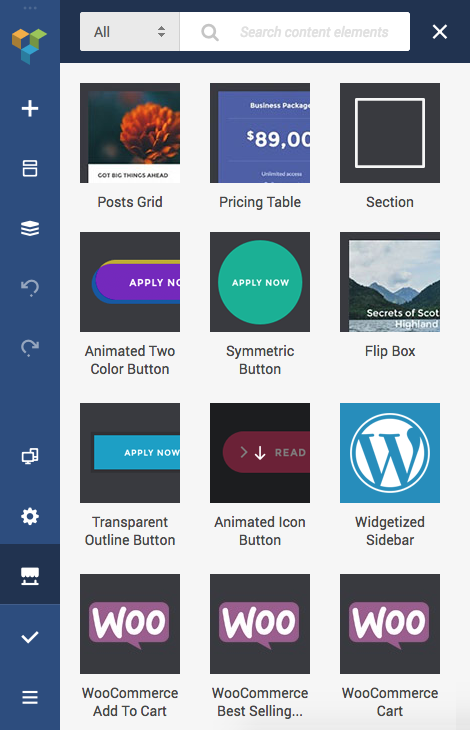 With regular updates, Visual Composer Hub offers the widest range of buttons, slideshows, and other types of elements and templates. You can access Visual Composer Hub directly from the Visual Composer Website Builder Frontend editor by clicking the Visual Composer Hub icon on your navigation bar. Once you download an element or template, it will be automatically added to your element or templates collection and will stay there forever. Simply hover any element in the Visual Composer Hub and click download – wait for the element to be downloaded and notification will appear. Note: For 3rd party integration elements (ex. WooCommerce) you will need to have 3rd party plugin installed on your website as well. If you don’t have Visual Composer Premium version – no worries. You can still access Visual Composer Hub to check the elements, templates, and addons before you go Premium.